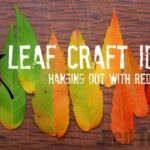 Hello again, welcome back to kids crafty and our leaf crowns this week… now… ever since working on the “Get Crafty with Nature” ebook, we have been wanting to make some leaf crowns – Leaf Crafts are fantastic for this time of year. Red Ted loves collecting leaves and autumn has such beautiful colours, that this really is the best time of year. 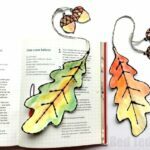 This is a wonderful Autumn Craft for Kids idea and can be made whilst out an about in the woods or parks this autumn! If your kids are a little young – make them FOR YOUR kids. If they are older, they should be able to manage themselves. 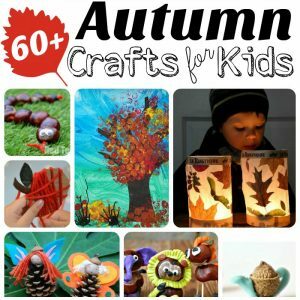 We do have a fantastic list of Autunn Crafts for Preschoolers for you to check out too! 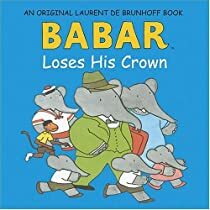 Babar Looses his Crown, by Laurent de Brunhoff. If you are not familiar with the Babar series of books you really should give them a go. I think I may be a little nostalgic here, as I clearly remember them from when I was a little girl. We now have a couple of the Babar books – and the children are enthralled by them. There is usually an adventure and lots to learn. In this particular book, Babar goes to Paris with his family, when, oh no, his suitcase is accidentally switched with that of a “moustached man”… and his suitcase contains his crown. Babar is quite distressed at his grand opera visit that evening without a crown. So on the hunt they go all around Paris – a great little way to see the Parisienne landmarks. The very first Babar book has quite text heavy so we often skim it a little as the children want to look at the next pictures. This one however is a shorter one with only 1-2 sentence per page. Great for small people’s concentration spans.As a cautionary note: the very fist book features Babar’s mother being shot and an old King eating poisonous mushrooms – explain that to a 3yrs old! None of that in this book.. and yet both books are much enjoyed by the children. We have a choice of video and step by step photos once again…. Pip Squeak adores getting dressed up and loves wearing all sorts of crazy outfits. So I thought this would be perfect for her. Sadly not. She ran a temperature that day and the minute I placed the crown or her weary head started crying. Poor little thing. Hopefully we will be making more of these in the coming weeks and years. 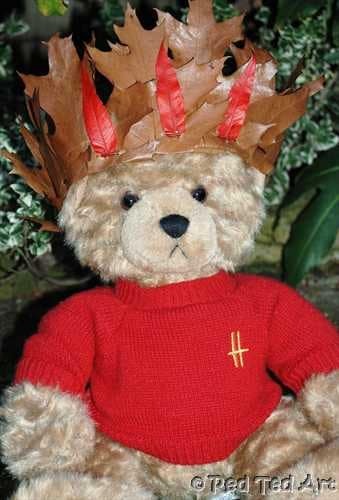 And maybe Red Ted will want to try and make one himself soon! Which means you will have to be happy of a photo with teddy wearing it! (It looked SO cute on Pip Squeak… much nicer than on teddy *sigh*). 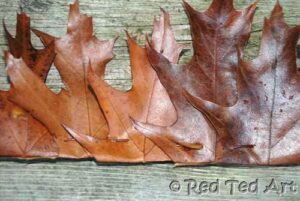 1) We used around 12-15 leaves, as our leaves were narrower (the width of an adult hand? 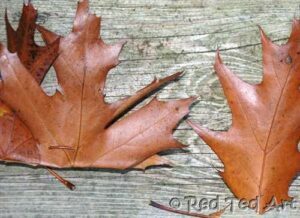 But if you use those large beautiful maple or oak leaves or similar, you may only need 7-8?). 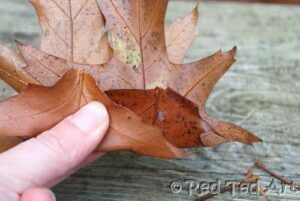 And try and find leaves with a reasonable amount of “stem”. The first thing you need to do is remove the stem. I removed the stem one at time, so as not to loose them in the windy Autumn weather. 3) Keep going until you have enough to fit around the child’s head. 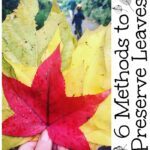 Secure the last leaf with the first leaf! And done! 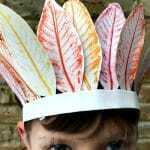 4) We found some GORGEOUS red leaves and pinned them into the front of the crown, by just “inserting” them into the front 3 stitches. Thanks for hosting! I love the leaf crown! Brittany – you are welcome! 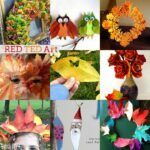 Becky – aaaah a pleasure, I love visiting all the crafts linked up and hooray for discovering the link up! 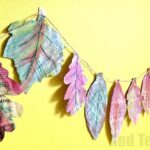 Yes, it is kind of buried in my Kids Craft post! Sorry! 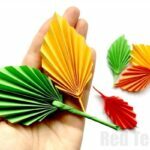 The leaf crown is great! Thank you 🙂 I just hope that the next one I make the children will wear!!! that’s a lovely crown and those red leaves are gorgeous! That looks so fabulous. Can’t believe you craft on the go – actually, I can believe that! 🙂 and yes, I neglect my child on the swing in order to make a crown, which she then doesn’t want to wear… *sigh* and isn’t Teddy simply dashing?! Ooooo, those leaf crowns are so fun!! What a fabulous idea! She was actually poorly… got her home quickly and shortly after getting home, she had high temperature… she is fine again now! Minty – yes, perfect for us mums dealing with lots of collected leaves in the home! Wow. That’s impressive. It turned out gorgeous. Ps. I love Babar too! Love the leafy crown, Maggy. Simple yet so pretty. The Babar stories sound interesting! Incidentally, Babar was also the name of a Mughal emperor that ruled India once! Thank you Rashmie! And that really is interesting! It wouldn’t surprise me if that is who Babar is named after!!! This is an amazing crown! It makes him look like king of an indian tribe. What a cute idea. We have so many red leaves in our backyard, this would be a perfect use…you can never have too many crowns 😉 Thanks for sharing! 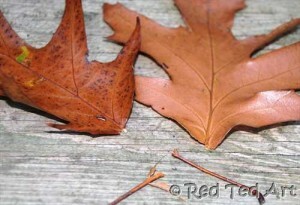 Ooh red leaves will look BEAUTIFUL! And yes, JDaniel4’s Mom, I reckon this would make a great addition to any Cowboys and Indian’s game! Thanks for linking up with us at the Outdoor Play Party, Maggy! We’ve never made one, but I’ve been wanting to! My son LOVES collecting leaves. He can be playing on a playground and see a leaf that he stops for. He always tells me “this is for my scrapbook” Lol. We need to make this! Thank you for posting. I’ve shared and stumbled! Aah bless him. They are adorable. Mine always says “Mummy, we have to basteln” (yes, mixing German and English, obviously we “craft in German” all the time… hence the word “basteln”)… have lots of fun and thank you for sharing!! How creative is that? It turned out great! Thank you for sharing this with us on The Sunday Showcase Always great to have you stop by! Awe thank you Trisha for the feature!! 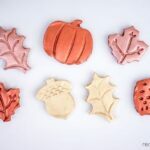 And fear not.. we will making these every year!!! Oh, my poor Pip Squeak. 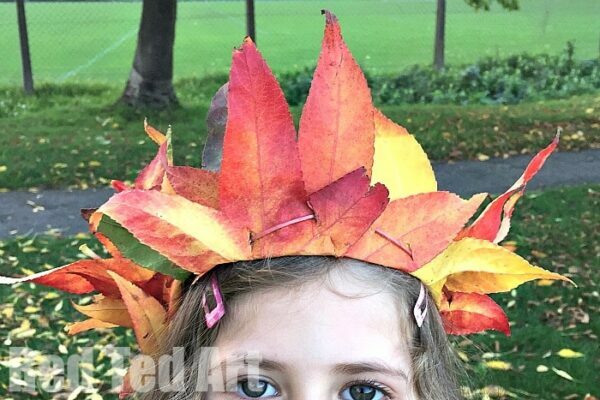 Is she more fond of leaf crowns now that she is older? Such a clever way to make a leaf crown. Thank you for sharing at the Outdoor Play Party.